The shoals of Black Rock in the shallow Caicos Banks. Black Rock, Turks and Caicos. Black Rock is an isolated shoal cay in the shallow waters of the Caicos Banks. The cay is located south of Middle Caicos, and southeast of the Middle Caicos Ocean Hole. Much of the low-elevation Black Rock consists of soft limestone, which has taken on a black patina from algae and the weather. 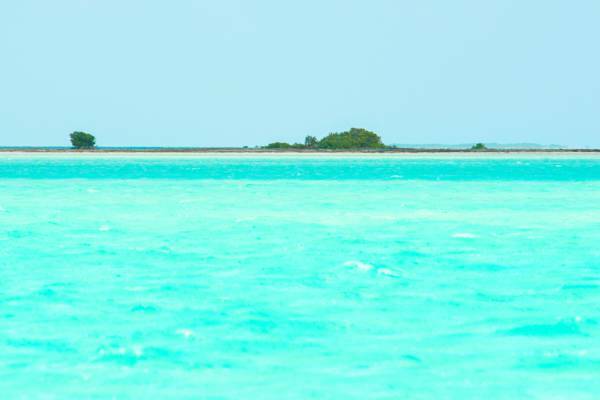 The cay’s solitary position is halfway between Providenciales and South Caicos, so it’s often used as a reference point when travelling across the Caicos Banks. Black Rock is quite small. At high tide, the cay is a narrow strip of ground that about 500 feet (150m) across. There’s not much vegetation on the rock, yet the area is a haven for birdlife. The Caicos Banks excels as a bonefishing destination, and the waters surrounding Black Rock are no exception. Several deeper channels run past Black Rock, and bonefish, tarpon, and barracuda are abundant in the region. There’s More Than One Black Rock! This cay isn’t the only Black Rock in the Turks and Caicos. There’s also a namesake limestone outcropping feature on the north coast of East Caicos. Black Rock on East Caicos is a low 'ironshore' cliff feature located on the otherwise sandy north coast of East Caicos. This low rock has naturally collected the highest density of flotsam fishing nets in the country. Last reviewed by an editor on 11 October 2018.